Thank goodness I don’t live in the Midwest because I don’t do cold weather very well. Yes, the leather and the fur and the cashmere are all so DELICIOUS to wear, but-47 degrees?! No ma’am, I DON’T THINK SO! This is the first teddy bear style coat I’ve ever owned (thanks, Banana Republic! ), and I must say, it lives up to the name and keeps me toasty & warm! Now granted, it certainly wouldn’t do a darn thing for the Chicago temps, but here in Dallas, a lightweight coat is really all you need! Thinking of all my readers who have been effected by this blistery, cold weather! Stay bundled! Courtney, yes, it’s been so cold here in Chicago, I am totally jealous of you only needing a lightweight jacket where you live. Granted we don’t get these temperatures every winter but those few days will last me a lifetime LOL, such a cluster this week has been! Adore the jacket of course, especially with that white denim. Your hair is really looking great lately! 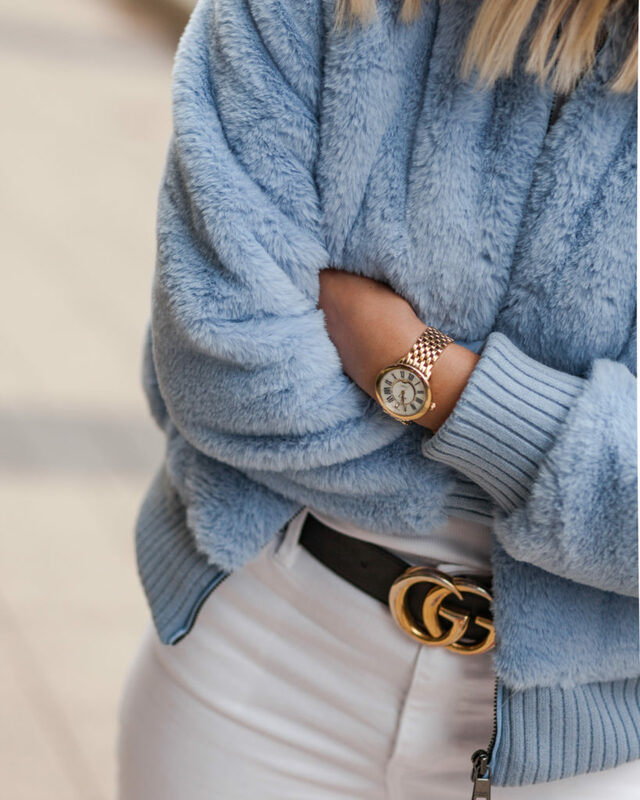 Loving this fun blue BR jacket!